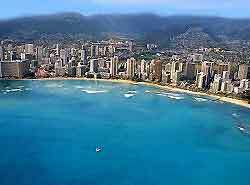 Honolulu, on Hawaii's beautiful island of Oahu, is the area's economic center, and is perhaps best known for its glorious Waikiki Beach. 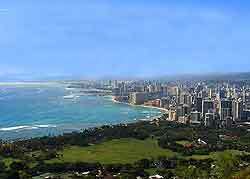 Filled with bright city lights, Honolulu contains many major shopping areas, five-star restaurants and wonderful views of the Pacific Ocean, and is also near to the Punchbowl and Diamond Head volcanoes, which are now extinct. Honolulu is nothing short of a tropical paradise, filled with palm trees, numerous white sandy beaches, interesting suburbs and clear waters, suitable for swimming, snorkeling and surfing. Maps and travel guides are readily available in Honolulu, with the Hawaii Visitors and Convention Bureau at the Waikiki Business Plaza on Kalakaua Avenue being a reliable source of tourist information. Expect to find details about attractions and leaflets at tourism outlets throughout Oahu, as well as information about Hawaiian island hopping and cruise possibilities. There are a good selection of hotels and accommodation in the city, often with superb ocean and city views, suiting those looking for Hawaii vacation packages. Hotels in Honolulu are concentrated around downtown, in the Capitol district, the Central Business District (CBD), the historical Chinatown neighborhood, the Waterfront district, and the Waikiki Beach area. A number of hotels are also situated close to the Honolulu International Airport (HNL), which is only 4 miles / 6 km to the west of the city and easy to reach by road. More information about Honolulu Hotels. Honolulu has many world-class tourist attractions, including the Aloha Tower - a major island landmark, once the tallest building in Hawaii; the Aloha Tower Marketplace - probably the city's most popular and lively shopping center; Honolulu Zoo - housing an assortment of animals in natural enclosures; the world-famous Waikiki Beach - home to a vast stretch of fine, white sand and good surfing; Kahaloa and Ulukou Beaches - second only to Waikiki Beach in terms of popularity; and the Royal Hawaiian Hotel - one of the most famous buildings on Waikiki Beach. Other popular attractions in Honolulu include Diamond Head - offering fantastic ocean views from the cliffs; the Nuuanu Pali Lookout - a number of high cliffs boasting scenic views; the Punchbowl Crater - an extinct volcanic crater once an important sacrificial ground; Iolani Palace - a magnificent 19th-century palace; the State Capitol Building - an unusual landmark with volcano-like legislative chambers; the Falls of Clyde - a historic, fully rigged, four-mast ship; the Byodo-In Temple - a grand replica of an ancient Japanese Buddhist temple; and the Foster Botanical Gardens - beautiful botanical gardens containing an outstanding collection of exotic plants. 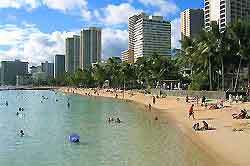 More information about Honolulu Tourist Attractions and Honolulu Landmarks. Honolulu has many excellent museums and tourists are strongly advised to look out for the Battleship Missouri Memorial - containing the USS Missouri; the Bishop Museum - full of Hawaiian history and information about the city's rich past; the USS Bowfin Submarine Museum and Park - home to an original WWII submarine; the Honolulu Museum of Art - a merger of the former Contemporary Museum and the Honolulu Academy of Arts; and the Hawaii State Art Museum - a vast complex with many Hawaiian works of art. More information about Honolulu Museums and Honolulu Art Galleries. Tourist attractions located close to Honolulu include the Diamond Head State Monument and Park - an extinct volcanic with ocean views; Hanauma Bay - Oahu's premier snorkeling destination; Kailua Beach Park - a haven for windsurfers; Kualoa Regional Park - with wide open grassy expanses and a narrow beach; Pearl Harbor - containing USS Arizona Memorial and a visitor's center; and Waimea Bay - on Oahu's north shore, famous for its winter surf. 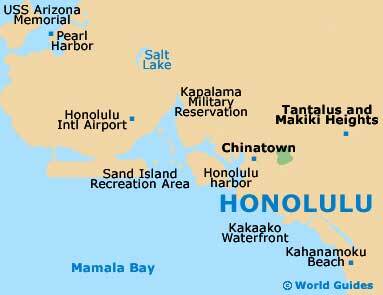 More information about Attractions Nearby Honolulu.